Shop from now until June 15, 2016 and save big at OshKosh B'gosh stores in the U.S. Take 20% off your in-store purchase of $40 or more. Or, take 15% off your entire purchase (no minimum spending needed). Source of the information is OshKosh B'gosh. Offer is valid with printable coupon only. Offer is valid until June 15, 2016. 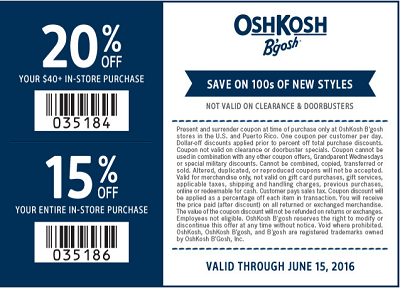 For more details about the offer visit your nearest OshKosh B'gosh store location in the U.S.